President Donald Trump and Saudi Arabia&apos;s King Salman bin Abdulaziz al-Saud take part in a welcome ceremony ahead of a banquet at Murabba Palace in Riyadh on Saturday. RIYADH, Saudi Arabia — With trumpets blaring, cannons booming and fighter jets streaking overhead trailed by red, white and blue contrails, President Donald Trump arrived in the scorching heat of the Arabian desert Saturday hoping to realign the politics and diplomacy of the Middle East by forcefully reasserting U.S. support for Sunni Muslim countries and Israel against Iran’s Shiite-led government. The start of Trump’s first trip abroad since becoming president — coming amid the scandals and chaos engulfing his administration — was intended to be a blunt rejection of President Barack Obama’s vision for the region. Obama sought a reconciliation with Iran and negotiated a deal intended to keep Tehran from developing nuclear weapons. As Trump arrived in Saudi Arabia, Iranians re-elected President Hassan Rouhani, who sealed the nuclear deal. 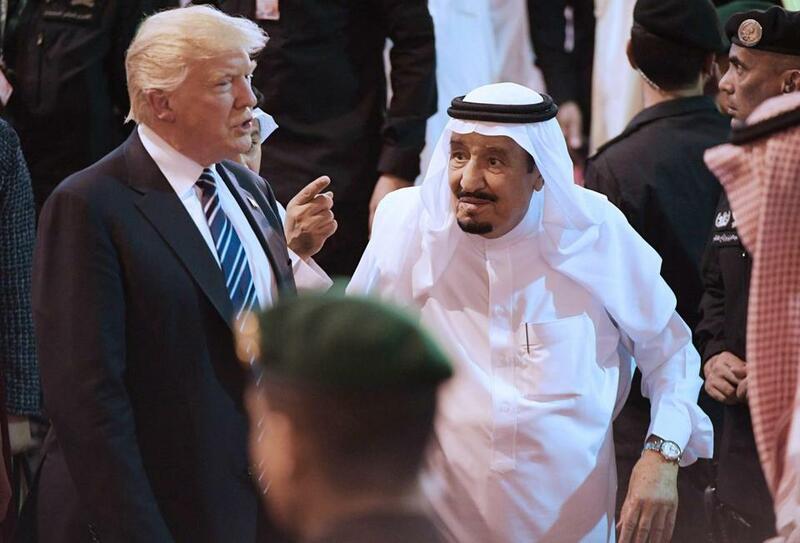 Trump, whose face was plastered on billboards around the city, was greeted warmly by Saudi leaders, who had grown weary and disenchanted with Obama. They fault him for failing to intervene forcefully in the Syrian war and for what they view as tolerance of Iranian support for terrorism. For Trump, the warm embrace by the Saudi monarchy was a welcome break from the cascade of bad news in Washington. Even as Air Force One took off from a Maryland air base Friday afternoon, headlines revealed new details about the swiftly expanding investigation into ties between Russia and Trump’s advisers. Questions about those headlines followed Trump across the globe, a reminder of the chaos and scandal dogging him back home. But the president at least initially resisted the temptation to deviate from his diplomatic script to address reports that he had referred to James Comey, the former FBI director, as “a nut job” during meetings with Russian officials in the Oval Office. Throughout his first day as the United States’ top overseas ambassador, Trump posed for pictures, shook hands with his hosts and avoided his domestic turmoil. The president’s aides scheduled the trip with no news conferences and few opportunities for reporters to ask the president questions. A forum bringing together U.S. and Saudi corporate executives Saturday also produced a series of multibillion-dollar deals. Among them: Lockheed Martin signed a $6 billion letter of intent to assemble 150 Black Hawk helicopters in Saudi Arabia, and General Electric announced a series of projects it valued at $15 billion. On Sunday, Trump is scheduled to deliver a speech that White House aides described as a call to Saudi Arabia and the rest of the Muslim world to unite against extremism. One senior White House official said the president hoped to “reset” both the global fight against Islamic terrorism and his own reputation for intolerance of Muslims, which was fueled by his campaign call for a “total and complete shutdown of Muslims entering the United States.” After taking office, Trump signed an executive order to temporarily block visitors from several Muslim-majority countries, but courts have blocked it pending a legal review. Trump’s royal hosts, whose country was not among those whose citizens would be barred, have chosen to ignore that history in the interests of working with a U.S. president who seems to share their goals and will not lecture them about repression of women or others in Saudi Arabia. “Traditional Arab allies welcome the U.S. back because they believe it is largely on their terms: a U.S. that is clearly anti-Iran and anti-political Islam, a U.S. that de-emphasizes political reform and human rights, a U.S. that is in business mode and a White House that seems more accessible than in the past eight years,” said Emile Hokayem, a senior fellow at the International Institute for Strategic Studies, who is based in Beirut. Tamara Cofman Wittes, a former State Department official who worked on the Middle East under Obama, said Trump’s goal of aligning with the Sunni states fundamentally conflicted with his desire for closer relations with Russia, which has sided with Iran in bolstering the government in Syria’s civil war. Allowing President Bashar Assad to remain in power in Syria under Iran’s thumb is precisely the outcome the Sunni states and Israel oppose, Wittes noted. “Quite frankly, I don’t see how either of these trajectories actually helps achieve the primary national security imperative that the United States faces in the Middle East, which is to disrupt and defeat violent terrorist groups like ISIS and al-Qaida,” said Wittes, who is now at the Brookings Institution in Washington. Trump is the first sitting president to make Saudi Arabia the first stop on his first foreign trip. The visit is the first of a nine-day trip that will also take the president to Jerusalem, Bethlehem, the Vatican, Brussels and Sicily. On Friday, Trump announced the nomination of Callista L. Gingrich, the wife of Newt Gingrich, the former House speaker, to be his ambassador to the Vatican. Air Force One landed in Riyadh, the Saudi capital, after a flight from Washington that took 12 hours and 20 minutes. Aides said Trump spent most of the flight meeting with staff members, reading newspapers and working on his speech. He got very little sleep, they said. 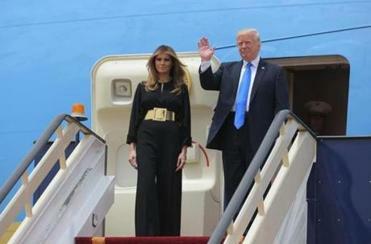 The president and his wife, Melania, emerged from Air Force One against a stark desert backdrop Saturday morning and were greeted on a long red carpet by King Salman, who was leaning on a cane, and other members of the Saudi royal family. After a ceremony at the Royal Court Palace, King Salman bestowed the Collar of Abdulaziz Al Saud Medal, the nation’s highest honor, on the new president, draping the gold medal and chain around Trump’s neck. Later, after a luncheon, the president met with the king before signing the arms deal in an elaborate ceremony. Previous recipients of the award include Barack Obama and Vladimir Putin, the president of Russia. Last year, Obama visited Saudi Arabia for meetings with King Salman and gulf leaders, but the king did not meet him on the airport’s tarmac. Obama’s aides later played down the king’s decision, but it was broadly portrayed in news accounts as a snub. At the airport when he arrived, Trump and the king exchanged a brief handshake and a few pleasantries. “Very happy to see you,” the king said. “It’s a great honor,” Trump replied, before he was offered a bouquet of flowers from Saudi girls.